The Lee Centre is an elegant late Victorian building at the junction of Aislibie and Old Roads in Lee. It is currently used by a couple of voluntary sector organisations. Both the building, and its predecessors on the site, have interesting stories – this blog post outlines the history. 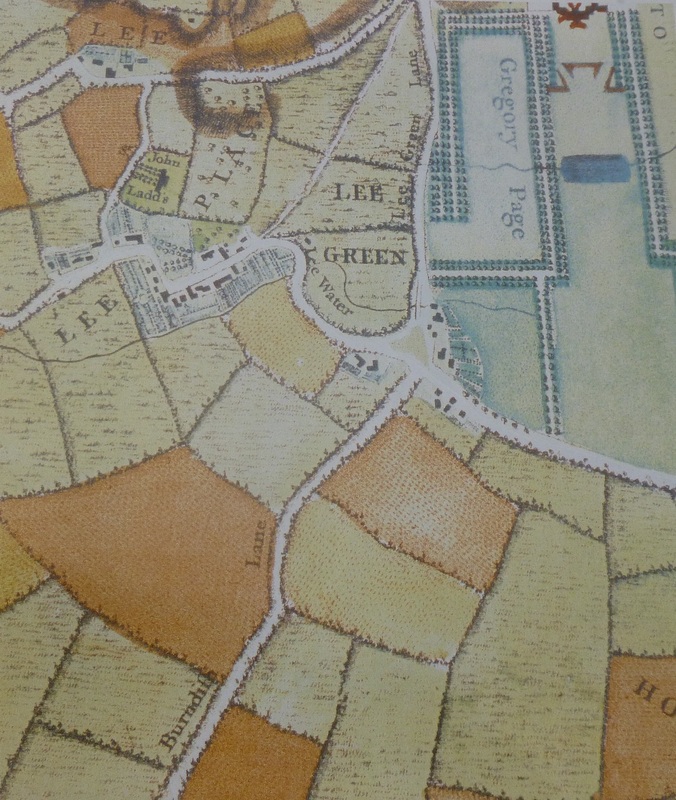 The site was for centuries ‘home’ to Lee House, a medieval mansion that was probably the last building showing on the bend of the main road on the southern side of John Rocque’s map from the 1740s (see below (1)). This was, of course, before Lee High Road was straightened following the breakup of the estate of Lee Place in 1824. At that point Old Road was given its current layout. The original Lee House was probably a Tudor mansion and was known to have rush and clay partition walls (2). Relatively little is known about the early history of the House although it was to become one with Republican links – it was home to the family of one of the Regicides of Charles I (3) and then owned by the slave owner and trader, Maurice Thomson. Running Past has already covered Thomson and his brother George who may have built Lee Place and who also had clear links to slavery. In the early 18th century the House was owned by the Lewin family (4), then home to the Huguenot Jamineau family (5) and later to City merchant and Alderman Sir George Champion (6). Champion’s daughter Mary was to marry Sir Thomas Fludyer in 1742 who inherited the house (7), presumably on George Champion’s death in 1754. 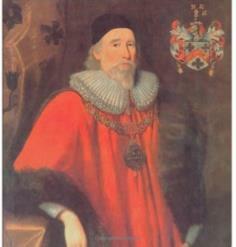 Sir Thomas Fludyer was brother of Samuel who lived at Dacre House, more on him at some stage in the future. Thomas was elected as MP for Great Bedwin in 1767, a seat that he swapped for his brother’s Chippenham seat on the latter’s death in 1768 (8). He died the following year in Hackney although his body was buried in Lee (9). Lee House was left to his daughter, Mary, better known by her married title, Lady Dacre. She was to live at the eponymous House, further up the hill towards St Margaret’s Church. Her time in Lee will be considered in more details in a future post on Dacre House. The House was sold on by the early 1770s to Henry Pelham (10). Pelham was the nephew of two Prime Ministers – his namesake who died in office in 1754, as well as the Duke of Newcastle. Lee’s Henry Pelham had been briefly an MP, but by the time he moved to Lee was Commissioner of Customs in 1758, a role he continued in until the 1788 retiring on a pension of £761 (worth around £1.4m at 2018 values). Henry Pelham died in 1803. Around 1807 (11) the House was bought by the banker and MP for Taunton, William Morland; he died in 1815 with his wife remained at the house until her own death in 1826. The House was then inherited by their grandson Sir Francis Bernard Morland. Sir Francis demolished the old house within a year or two, along with a neighbouring house on Lee High Road which had previously been home to Alexander Rowland, the barber who popularised the use of Macassar Oil, who had died there in 1823. As F W Hart noted, many of the older houses in Lee had been considerably extended over the years (as we have seen with Pentland House) but done in a way that didn’t meet the aspirations of the wealthy early Victorian Kent country gentleman. The realignment of the road provided the ability to design a home with a sweeping drive and gatehouse so gave added impetus for change. While Sir Francis Morland lived on to the ripe old age of 86, he moved on relatively quickly, as the occupant of the eight acre estate for much of the 1830s and 1840s were the Stuarts – William Forbes Stuart, a Scottish ‘merchant,’ and his wife Hannah. In 1841 they were living there with two grown up daughters a relative and eight live-in servants. The Stuarts (incorrectly spelled Stewart) were still there in the 1851 census; while their children had moved on, they had a retinue of 14 servants, including a pair of lodge keepers. The Stuarts seem to have sold up in the 1850s and moved to Brighton. 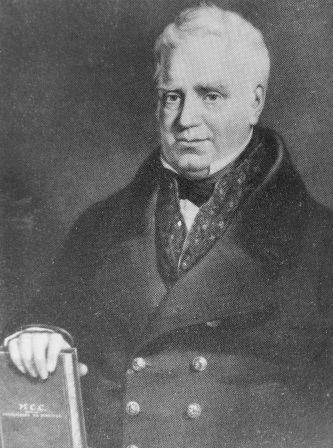 The purchaser was James Halliburton Young, a Justice of the Peace. he probably never lived there but he certainly added some of the land of Lee House to his estate at Cedar House which was situated on what is now the opposite side of Aislibie Road, and no doubt will be covered at some stage in Running Past. It is the collection of buildings between Lee House and Manor House on the Ordnance Survey map above. It isn’t clear who was at Lee House in 1861; it may well have been empty when the census enumerators called. In the 1871 Lee House was home to James and Anne Dale – it was clearly a time before contraception – there were 13 surviving children between 18 and just born living at the House along with 3 live-in servants. By 1881, while the Youngs were still next door, there was no mention of the House in the census, part of the site had already been sold off – the census lists St Margaret’s Home whose inhabitants included a curate. 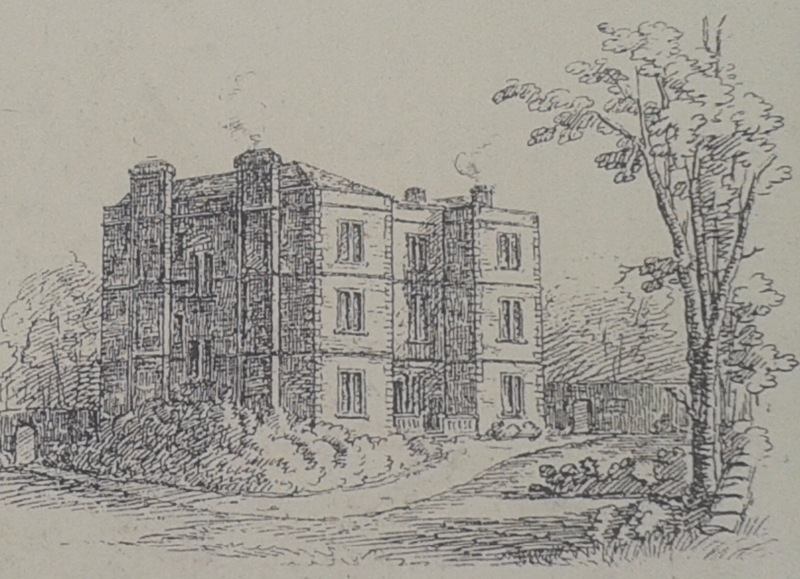 By the late 1880s, the house had been demolished and what is now Lee Centre at least had its foundation stone, with the grounds sold for the housing of Aislibie and Lenham Roads. 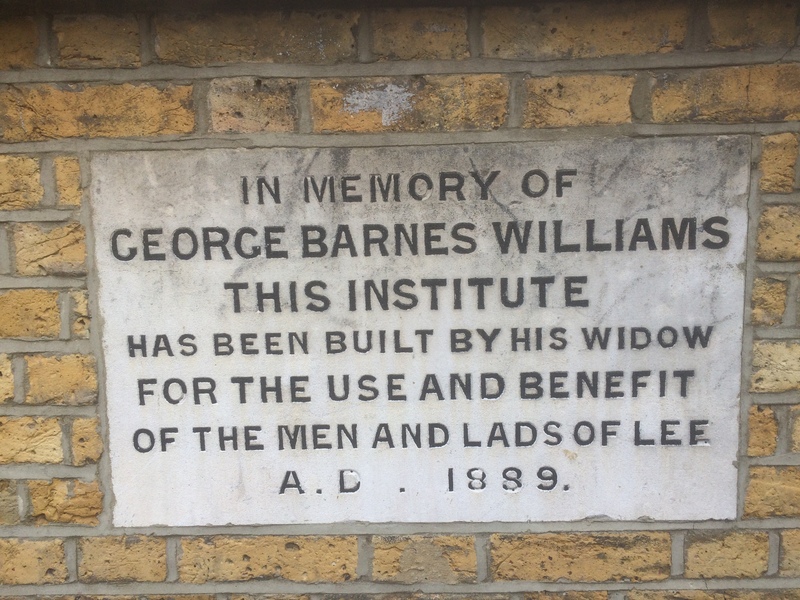 Part of the land was bought by the widow of George Barnes Williams, Helen, ‘For the use and benefit of the men and lads of Lee.’ The building is now known as the Lee Centre. George Barnes Williams is a name that has already had a passing reference in Running Past in that he was living at ‘Belmont’ (The House that Named the Hill) when the census enumerators called in 1871. He was an architect and surveyor, with a business based in Westminster. He was best known for his input into the refurbishment of the Mercers Hall between 1877 and 1881. In 1881 he and his wife Helen were living at 14 Brandram Road. George died in 1887. In addition to what is now the Lee Centre, it appears that Helen paid for a window at St Margaret’s Lee in his memory. Helen seems to have lived on at Brandram Road until her own death in 1894. From the outset there was a chess club based there, which was to be a feature at the Institute for at least 30 years, meeting initially on Monday and Thursday evenings (13). In addition to chess, there seems to have been a football team based there for a while (14), and an athletic club was based there in 1892 which met on Tuesday and Thursday evenings (15). How long the football and athletics clubs lasted is not clear, as there was only one mention for each in the local press. In its early days of operation the building was also used by Lee Dispensary – it was listed in the Kelly’s Directories there between 1895 and 1900. Certainly, when it was first considered by planners in 1888, the application from Helen Williams, was in relation to setting up a Cottage Hospital (16) so this may have been a relic of the original application. While initially it seems that the Institute was an independent one, by 1927 it had come under the wing of St Margaret’s Church whose parish rooms were then next door. The building was still home to the Chess Club which lasted there until 1930; the 1937 Kelly’s saw a solitary mention of St Margaret’s 1st Lee Scouts being based there. While the Scout group only appeared once in Kelly’s Directory, it seems to have been a feature there until the early 1960s, before the group moved to the then newly acquired Kingswood Halls. The building continued to be used to store camping and other equipment for Scout and Guides until at least 1960. The building was also used for storage by a father and son painting firm, Charles and Gordon Payne, in the late 1950s and 1960s, perhaps earlier. They lived in Dacre Park as war broke out in 1939 and continued to use a hand cart to transport materials around Lee into the 1960s when motorised transport had become the norm. The Working Men and Lads suffix lasted until 1953, by which time the building was just known as St Margaret’s Lee, Church Institute – a name which lasted in Kelly’s until 1980 by which time it was referred to as the Lee Centre. 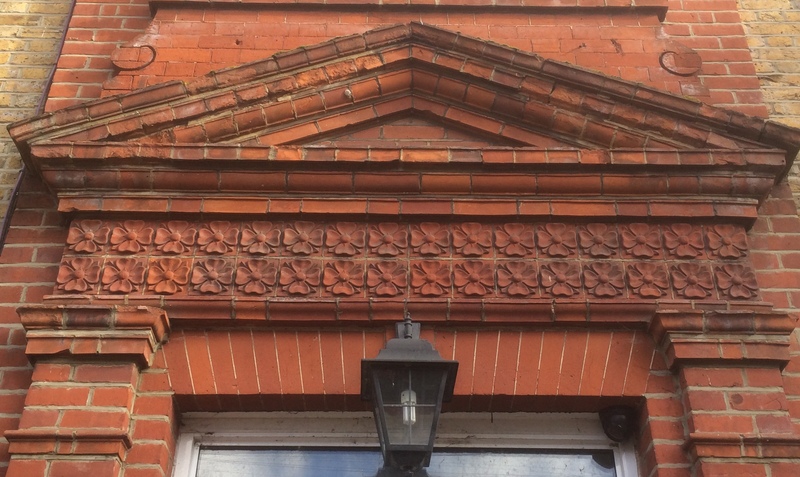 The mosaic above the door probably dates from around then – it certainly wasn’t there in 1979 when photographed. By this stage, the building was being used Goldsmiths College as a Community Education Centre, as part of their Department of Adult Studies. This had started in 1973 and continued until around 1991, the activities run from there included several reminiscence projects during the 1980s. 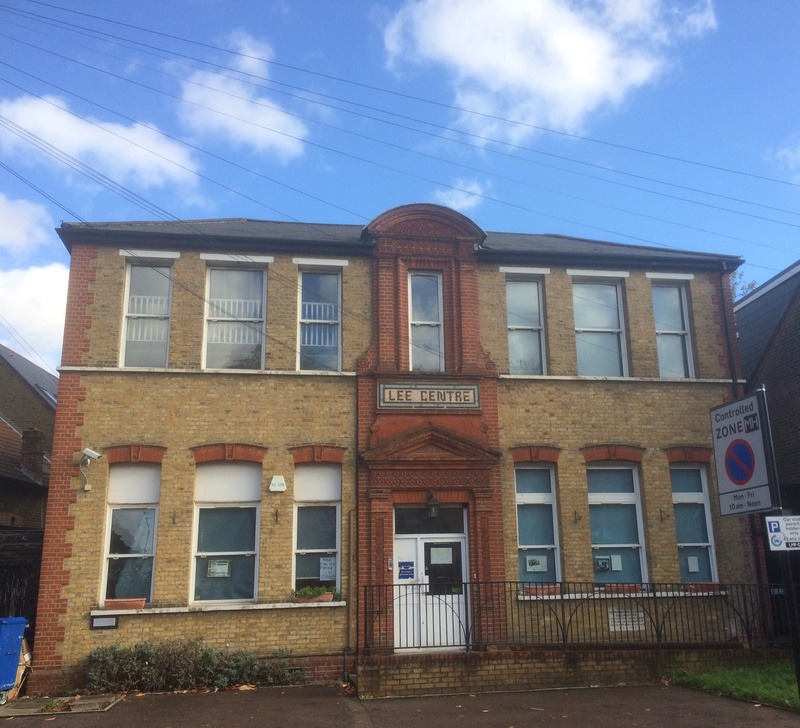 The building was also used for some Lewisham Council run Adult Education courses up until around the mid-1990s. In the more recent past it has been home to several voluntary sector groups – notably the Arts Network whose work was aimed at people with enduring mental health support needs and sought to provide ‘a supportive welcoming space for participants to explore their creativity.’ It often opened its doors to the public as part of Lee Green Open Studios, with the upper floor providing a pleasant airy space for displaying art. The project has now moved on to the Leegate Centre. At the time of writing (late 2018) the building was being used by Ubuntu, a Black social history project and Family Health Isis, a mental health project. It is a lovely building, although, oddly, neither Listed nationally by English Heritage or locally by Lewisham – it is certainly at least as worthy as the Grade II listed Lochaber Hall a couple of hundred metres away. This entry was posted in Uncategorized and tagged Aislibie Road, Alexander Rowland, Cedar House, George Barnes Williams, George Champion MP, Henry Pelham, James Halliburton Young, John Rocque, Lady Dacre, Lee Centre, Lee House, Lee Place, Maurice Thomson, Old Road, Sir Francis Bernard Morland, Sir Thomas Fludyer, William Morland MP on November 21, 2018 by Paul B. One of the underlying threads in the growth of Lee and the underpinning source of its wealth from the 17th century onwards was slavery – Running Past has covered this before in relation to the Manor House with the links of both Thomas Lucas and the Barings to it as well as to the last resident of Lee Place – Benjamin Aislabie, who kept his ties to the awful trade in misery beyond the time it was outlawed in the Empire. While what these Lee residents trading links were despicable, two of their predecessors on what is now the borders of SE12 and SE13 were considerably worse and helped paved the way for what was to come later – George and, more particularly, Maurice Thomson (they are sometimes referred to by the alternate spelling Thompson). Maurice Thomson lived at Lee Farm, sometimes referred to as Lee House (1), his brother George was one of the early inhabitants of Lee Place (covered in Running Past in 2014) it may even have been built for him (2). Maurice Thompson was described “England’s greatest colonial merchant of his day.” He was born into a wealthy family in Watton-at-Stone in Hertfordshire around 1600 and moved to Virginia around 1617, initially being involved in the supply of indentured servants (who were obligated to work only for a set period of time) and became involved in tobacco production directly himself – exporting 25% of Virginian output by the mid 1630s. His involvement in slavery began in 1626 – supplying 60 slaves for the Leeward Island of St Kitts. Over the next couple of decades along with a few other families, like the Noells, the Thomsons turned the English colonies in the West Indies into sugar producing islands totally dependent on slavery – there were around 12,800 slaves in Barbados by 1650. The number doubled again within a decade. The trade was effectively a three cornered one – taking slaves from Guinea and elsewhere on the coast of West Africa to the West Indies, bringing sugar back to Europe and then returning with provisions to West Africa. Thomson was also involved in a wide variety of other trade – including privateering in the Caribbean – essentially a legalised form of piracy, which has been covered in Running Past before, in relation to the name of the Antigallican Hotel in Charlton. Maurice Thomson’s first definite on-line links to Lee came when he took a 21 lease out on Lee Farm in 1662 from Francis Sherman, who had bought the farm in 1633. It wasn’t his primary residence for much of the rest of his life, this was in Haversham which is now part of Milton Keynes where he bought the Manor House in 1664. As discussed previously in a post , Slavery and the Manor House, there isn’t complete certainty where Lee Farm (sometimes known as Lee House) actually was in this period. 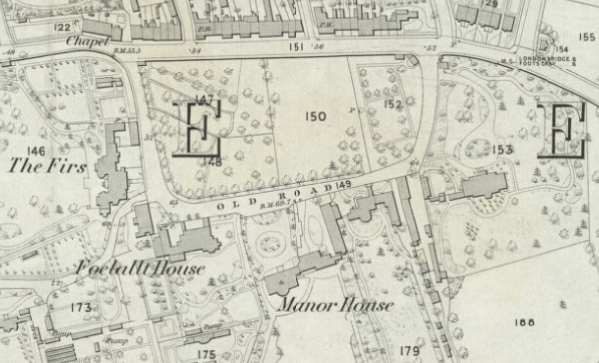 It may have been where the Manor House is currently sited or could have been close to the junction of Old Road and Aislibie Road. It seems likely that Maurice Thomson was living in Lee before 1662 – there was a Maurice Thomson in Lee in 1641, who had a son, also Maurice, christened at St Margaret’s Lee in May – it is known that Maurice Thomson’s first son who died in infancy was also called Maurice. He was also on hearth tax records from 1641 (3). John Thomson stayed in Lee until 1680 when the remainder of the lease was transferred to Elias Aston. John Thomson, married Frances Annesley, while she has the same family name as Brian who had been Lord of the Manor of Lee and an early 17th century court case seems to have at least partially inspired King Lear (covered in Running Past in 2014), she would have been no more than a distant relative – it has not been possible to find any direct link through The Peerage. Her part of family came from Anglesey. Of the Thomson brothers, George was much less involved in the slave trade, although his name crops up; it is with much less frequently than Maurice his brother. He settled in Virginia in 1623 before returning to London as a merchant trading with Virginia and the Caribbean – trade with these areas always indirectly involved slavery in this period. He is much better known for his political and military activity. George Thomson became actively involved in the Parliamentary cause as a soldier, losing a leg in battle. After the end of the Civil War he was elected to Parliament for Southwark, although fell out with Cromwell for a while. After the Restoration in 1660, George Thomson (picture below – source) seems to have laid low in Lee, but he was mentioned in hearth tax records in 1664 – he had the most chimneys in the parish, 21, six more than his brother at Lee Farm. While this is the first definitive on-line reference to him, like his brother, there are clear indications that he had been living in the area for a while – there are christening records from the 1645 with the correct names of children and wife. So it may be that he had been the first resident of Lee Place. He died in 1668, and the estate of Lee Place seems to have been sold to the Christopher Boone, who took up residence in 1670. Boone’s will makes reference to it having been bought from Thomson. This entry was posted in Lewisham History and tagged George Thomson, Lee Farm, Lee House, Lee Place, Maurice Thomson, slave trade, slavery on May 27, 2016 by Paul B. The blog has touched on Benjamin Aislabie a couple of times before, notably him being the last tenant of Lee Place – the first of the country houses of Lee, that was situated in the area bounded by the current Old Road, Lee High Road and Bankwell Road, although its estate extended much further. The long-term owners of the house, the Boone family, had ceased living in the house around 1770, letting it initially to Thomas Lucas who was to build the Manor House. Aislabie became its final occupant in 1809, taking on a 14 year lease. Benjamin Aislabie, son of Rawson and Frances Aislabie, was born in 1774 at Newington Green. By the time he moved to Lee he was a wealthy man, he would have needed to be to afford to rent Lee Place; he had made much of his wealth from the wine trade and was widely reported as having Nelson as one of his customers. Like a number of the former wealthy inhabitants of Lee, he had links to slavery in the West Indies and the southern states of the current USA, this is something that the blog will undoubtedly return to in the future in posts on Lee Farm, the Manor House and Dacre House. Aislabie was more unusual in that his links with the slave trade continued after it had been abolished in the British Empire in 1807. However, it still existed elsewhere and there was nothing to prevent British citizens having interests in it outside the Empire. It is known that Aislabie had a mortgage interest from 1812 in an estate in Antigua, and in his will he was owner of two estates in Dominica, one of which had 111 slaves, leaving them to his son Rev. William John Aislabie along with an income to his wife from them of £100 a year. Unsurprisingly, he was one of those in Lee who did not sign the Lee Petition in 1814 – calling on the government to insert a clause into a treaty with the defeated French to end slavery in their empire. took a lively interest in distributing the charities that severe winter to the poor; he also placed to the use of the parish the buildings in the front yard of his mansion, for the storage of coals and potatoes, which were given to the poor during the thirteen weeks’ frost; bread was very dear at this time, and Lee had no poor-house. Aislabie’s erstwhile landlord, Charles Boone, had died in 1819 and when the lease ended in 1823, it was not renewed, and Lee Place was sold. While FW Hart suggests he may have moved to Sevenoaks, it certainly wasn’t his permanent residence; in his latter years this was Park Place, next to Regent’s Park and close to the new home of the Marylebone Cricket Club (MCC), Lords. He was buried in Marylebone church in 1842. Aislabie had a passion for cricket and was heavily involved in the administration of the game through the MCC, becoming its President in 1823 and secretary from the year before until his death. In cricketing terms he is remembered though as having one of the worst first-class cricket records of all time. In part this was because he continued playing well into his later years – his final match was played against Cambridge University at Lord’s on 1 and 2 Jul 1841 when he was aged 67 years 169 days – the oldest ever English participant in a first class game. Under his tenure the club lurched from crisis to crisis, and while not dishonest, he was certainly a dreadful financial controller. He was also, among other posts, Custodian of the MCC Snuffbox. 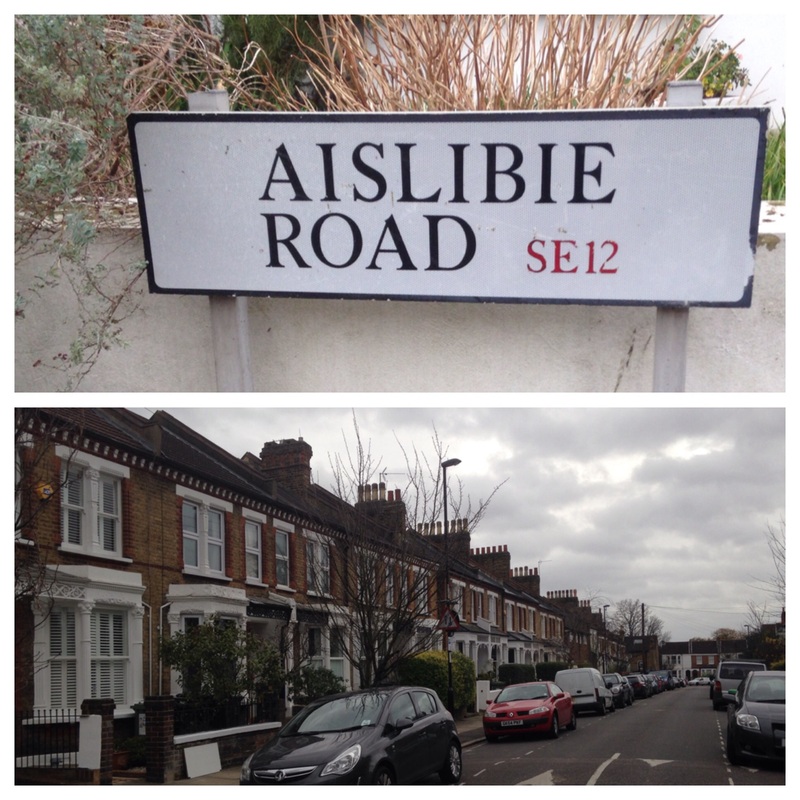 Given his links to slavery it seems strange that a man of Aislabie’s ‘pedigree’ has been remembered with a street name (albeit incorrectly spelled) from the 1890s, although perhaps the late Victorians in Lee and Lewisham were only aware of his past via the rose tinted glasses of FW Hart. This entry was posted in Lewisham History and tagged Benjamin Aislabie, Lee, Lee Petition, Lee Place, slavery on December 9, 2015 by Paul B. When thinking of new towns, the likes of Stevenage, Cumbernauld, Telford or perhaps Peterlee may spring to mind, but early Victorian Lee on the then outskirts of London? Lee New Town was much smaller than its Twentieth century counterparts – a few streets of homes mainly to house those working directly or indirectly for the wealthy residents in the existing large houses in Lee but also the new, substantial homes being developed in the area. Lee New Town was built from 1825 and was made possible by the break-up of the Boone estate and the demolition of Lee Place 1824, once its final tenant Benjamin Aislibie moved out , this was covered a few months ago in the blog. It is possible to build up something of a picture as to the people living in Lee New Town in the late Victorian period. From 1881 census, data on 16 households a reasonable cross section of the around 200 homes was reviewed (1). 38% of the heads of household were in some form of service for the wealthy of the area – including trades such as gardener, housekeeper and coachmen, much of the rest that were reviewed tended to be either shopkeepers, there were two grocers, or more skilled manual workers such as bakers, a painters and a police constable – the only exception to this was a laundress was in Blows Place – see below. The area reflected the growth and migration into London, only two of the heads of household originated in the local area, it also reflected high mortality levels – 56% having no surviving partners, with several men with very young families and relatives or lodgers, presumably, looking after children. Turners Road – much more of a mixture a few houses at the northern edge with servants (pink), much smaller to the southern end (near Lee High Road) where working people (pink to purple). Dacre Square – ‘narrow paved court, two rows of six cottages. Very small some broken windows stopped with paper. Light blue’ Photo from a few years later (3). Some of the New Town was demolished by German WW2 bombs, there were Blitz strikes on Lee Church Street, Boone Street and Dacre Park/Turners Road, as well as one earlier in 1940 in Boone Street. Some of these sites were used for 25 pre-fab bungalows, although unlike others such as the Excalibur Estate and on Hillyfields they were relatively short lived. substandard houses in disrepair, with sanitary defects and bad arrangement of staircases, passages or water-closets, rendering them unfit for human habitation or injurious to health, and for which the most satisfactory method of treatment is by the demolition of all the buildings. Dacre Street around 1953 (see note 4). In addition to the pre-fabs, around 135 homes, a couple of halls and 10 shops were demolished with plans to re provide around 183 new homes, all flats plus 8 shops. In the end the ‘mix’ in the new development was slightly different with a small number of houses also built with slightly fewer shops. Lee Church of England School was also demolished sometime after 1959 (the date of the first photo (see note 5) with the new school opening in 1963. There are two small terraces that remain, on Dacre Park, and on Lee High Road, next to the former Swan. There also may be a solitary house from the New Town on Fludyer Street, formerly Dacre Street. 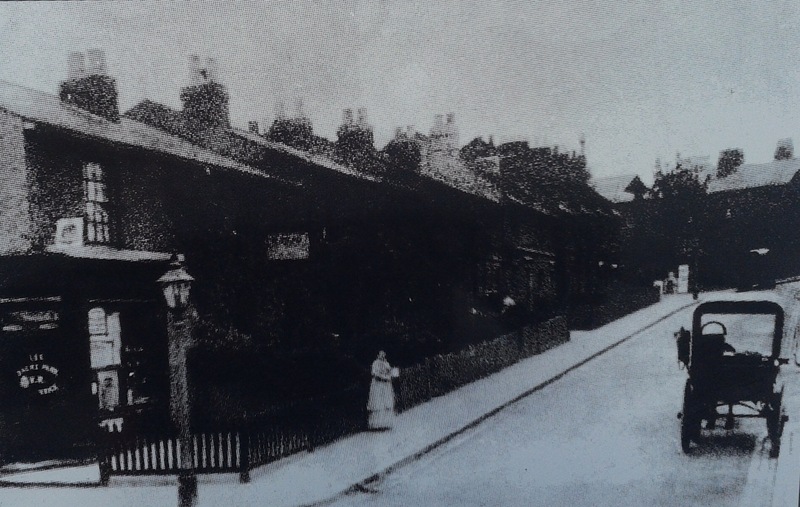 Other than this, all that now remains of Lee New Town are the four pubs, from the top right the Greyhound (now offices), the Royal Oak (now flats), the currently unoccupied Woodman, and the Swan (now Rambles Bar) – the reasons behind its name was covered in a post a few weeks ago. Source for 1881 Census data – Family Search – film 1341170 but research for this blog. Source for black and white photograph http://collage.cityoflondon.gov.uk/collage/app Record number 189098 / Catalogue reference: SC_PHL_02_0327_59_2658 – permission give for use here, but no rights to elsewhere. This entry was posted in Lewisham History and tagged Boone Street, Boone's Street, Dacre Park, Dacre Street, Lee Church Street, Lee New Town, Lee Place, St Margaret's Lee CoE School on February 26, 2015 by Paul B.
Lee is now was very different to how it was in the past, that doesn’t make it that dissimilar to any other place in the country. What is really different is that it has moved. What is now regarded as Lee, the area around the station, and Burnt Ash Road/Hill is a mile away from its historic centres – Lee was previously three small settlements – on Belmont Hill, around Old Road and around Lee Green. 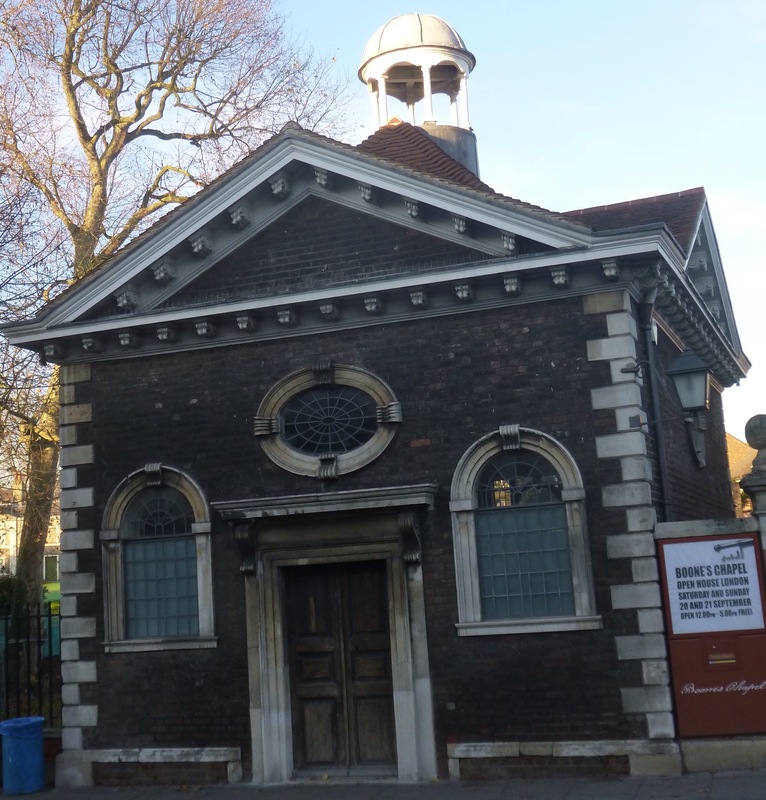 Old Lee was a place for the rich, with some of the wealth having its origins in the slave trade and Deptford. There were several very large houses stretching from The Cedars on Belmont Hill in the north to the Manor House in the south – over time I will probably touch on all of them, but I will start with one that is no longer there – Lee Place. There is a logic to this in that its disappearance helped shape the current development of the area in that it allowed the straightening of Lee High Road. There had been a large medieval moated farm, latterly known as Annesley’s House, located some distance away, to the north of the High Road – roughly where St Margaret’s Lee CoE School is now. This estate was fragmented in the early 17th century following the death of Brian Annesley. The end of his life, and his at least partial inspiration for King Lear, was covered a few months ago in the blog. This fragmentation of the old estate seemed to allow the development of a series of slightly smaller merchant’s houses in the area. Lee Place was one of the first of this new generation of houses and was built in the early 17th century. 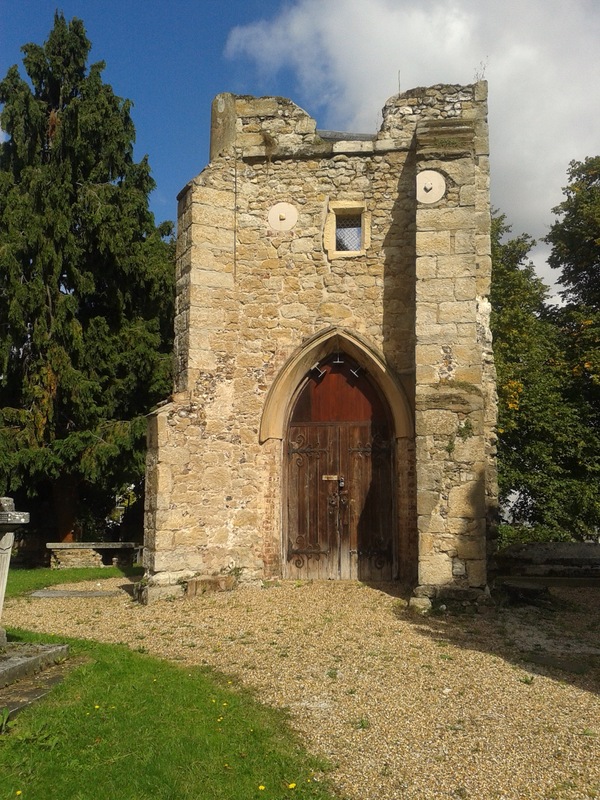 It was located just to the rear of the western side of the current Bankwell Road (named after Lords of the Manor of Lee in 13th and 14th Centuries). Its grounds included an area largely bounded by the current Old Road, which then formed the main road from Eltham westwards towards London but included an area to the north of it as well. There was a partial moat, probably originally Annersley’s, and small lake just north of the current Lee High Road, behind the petrol station and Rambles bar. There will be another post on this in the New Year. Relatively early in its history it was home to Christopher Boone, a wool merchant in London. His name lives on with the estate chapel that bears his name and was a mausoleum which was built in 1683 – more that sometime in the future. The main entrance to the estate was adjacent to the recently refurbished Boone’s chapel. 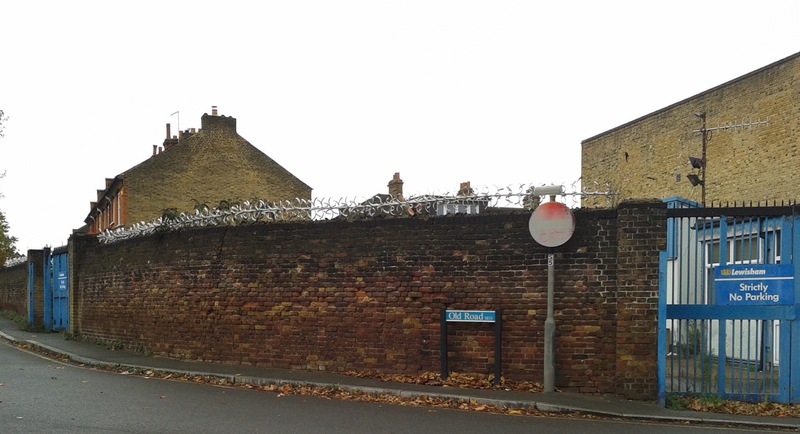 Other than Boone’s Chapel, the remaining sign of Lee Place is part of its boundary wall facing onto Old Road, it was the external wall for a now unused council depot, while old, it isn’t brickwork of any great beauty. Lee Place almost certainly not built by the Boones, the 1664 Hearth Tax listed it as being owned by George Thomson and having the most chimneys in the parish – 21. He seems likely to have been the brother of Maurice Thomson – who lived nearby and was heavily involved in slavery, Running Past will return to him in the future. Assuming it is the same family, George Thomson had been a member of the Long Parliament and was also heavily involved with slavery. The Boone family lived in the Place for most of its life, after Christopher’s death the house was inherited by his son Thomas. It then passed to Thomas’ daughter in 1749 to live in until her death when it passed to Thomas’ nephew, Charles Boone. Around this period, the house was let to Thomas Lucas who went on to build The Manor House – which was completed in 1772. Charles moved into Lee Place in 1777, although by 1797, possibly earlier, he was letting it out to Benjamin Harrison, and then to Benjamin Aislabie (the Victorian street at the south east corner of the estate is named after him, albeit spelled ‘Aislibie’) for 14 years from 1809. Turner Road (now Dacre Park) on the edge of the ‘New Town’ – from information board by Kingswood Hall Lee High Road was straightened soon after the sub-division of the estate, but the immediate grounds of Lee Place remained as small fields. There were some Victorian shops built along the straightened Lee High Road with a depot for the Cheisman’s store in Lewisham behind them on Old Road. The terraces of Bankwell Road and part of Old Road were built around 1907, and the long gone cinema Lee Picture House, on the corner of Lee High Road and Bankwell Road first opened its doors in 1910. The remainder of the northern side of Old Road and Lee High Road (Market Terrace) to the west of the cinema weren’t developed until the mid to late 1930s. This entry was posted in Lewisham History and tagged Boone's Chapel, Brian Annesley, Lee, Lee Place on December 10, 2014 by Paul B.